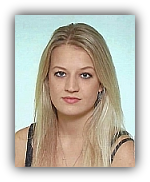 Eva Novotná graduated in Pharmacochemistry and Medicinal Materials at the University of Pardubice under quidance of F. Bureš in August 2016. Her bachelor work focused on cyclic 1.3-dicarbonyl compounds featuring fused heterocyclic moiety and active methylene group for application in Knoevenagel condensation. She is currently continuing Master´s studies in the BUReS group. Design and synthesis of push-pull chromophores bearing ThDione as an electron acceptor unit.